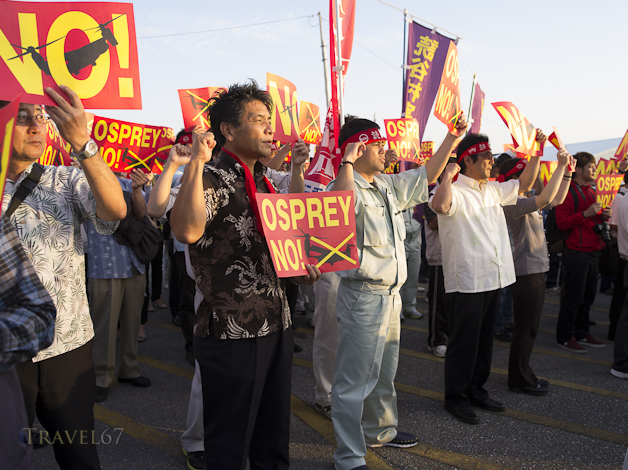 Another No Osprey protest took place last week outside of Torii Army Base. It was much smaller than the event I’d previously photographed near the Ginowan Convention Center. 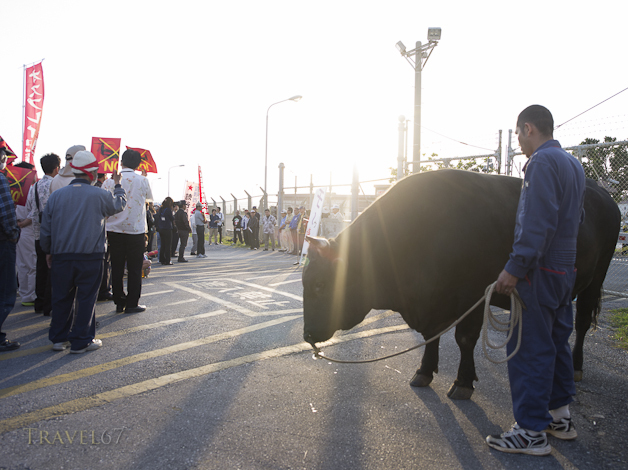 On Friday, there were around 100 protestors (and a couple of bulls), and it only lasted for around 30 minutes. There were several short speeches by leaders of the group about not wanting Osprey helicopters and military bases on Okinawa. Then as a group they faced the gate and shouted their demands. They chanted in Japanese that they didn’t want the helicopters, they didn’t want bases, and they didn’t want military on Okinawa. Then after a brief pause, the chant became “Yankee go home, Yankee go home, Yankee go home.” This was the last thing shouted, and then the protest ended and the gathering broke up. 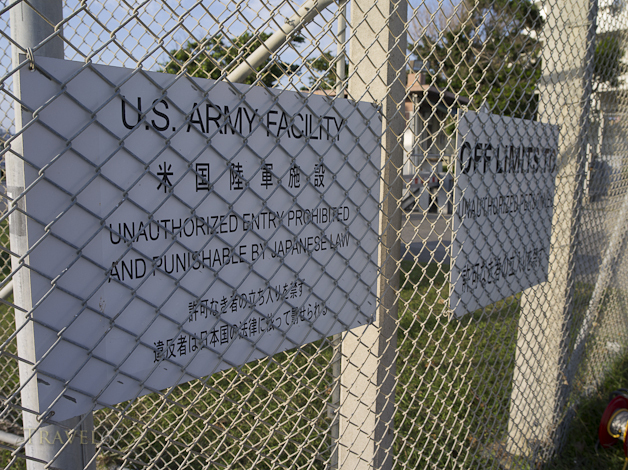 The presence of military bases in Okinawa is a contentious and complicated issue. 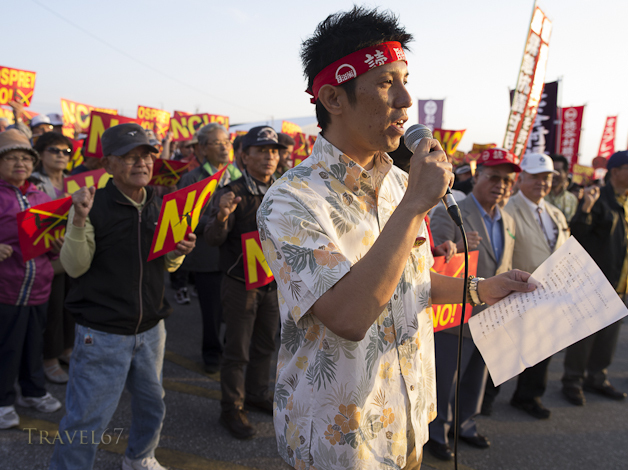 The Okinawans have every right to voice their opinions and try to effect change on the political situation. However, to end a demonstration repeatedly chanting “Yankee go home,” left me with with a feeling of frustration and annoyance. I presume what they meant by Yankee is American Military, but Yankee is slang for American not American soldier. It’s a small point, but generalizations like this are at best lazy, and at worst dangerous. The issue is not about Yankees, it’s about the American military presence. 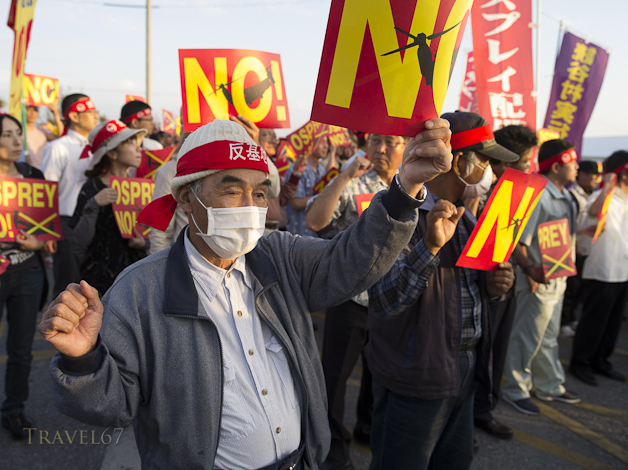 Rather than discussing the continuing presence of Marine Corps Air Station Futenma, the protest was focused on a particular type of helicopter outside a base which those helicopters rarely visit. Perhaps all they were looking for was a photo and a few lines of text in the local newspaper, but as an effective way of creating change, I think there must be better ways of doing it.